BANGKOK — There were a host of heroes in July's dramatic rescue of 13 members of a youth soccer team from a cave in northern Thailand ... and then there were the hapless would-be helpers from the Thai Well Water Association. It turns out that 17 people in all were rescued by the expert foreign cave divers who rushed to lend their unique abilities to save the boys and their coach. The story of the first four people to be rescued— barely reported and now mostly forgotten — was recounted Wednesday by the association's president, Surapin Chaichompoo, who explained how he and three employees spent two days draining water from the cave in an attempt to help the rescue, took a nap, and found themselves trapped inside with the water rising. He said that on their third day of being trapped, two British divers searching for the boys stumbled upon them and improvised a rescue, taking them out one by one after giving them a 30-minute crash course in diving. Surapin said they made their way through the murky waters by swimming and sometimes walking, trying to avoid sharp obstacles in the low visibility. Surapin said he was unable to contact them afterward, but would still like to thank them. "I really owe my life to these two divers. They were here to help the 13 people but I got stuck first after I went in to work. If they didn't save me that day, I wouldn't be here today," Surapin said by phone from the northern city of Chiang Mai. "The same for the other three people. I really owe them, the two divers John and Richard. If they are abroad, I will fly over to personally thank them myself." The tale of the little-known first rescue resurfaced Saturday when Rick Stanton — who with diving buddy John Volanthen discovered the four on June 28, and the cave boys on July 2 — gave a talk at the annual "Hidden Earth" conference of British cavers in North Somerset in England, according to a report on the website Darkness Below, which carries news for underground explorers. The two divers had arrived at the cave site just the day before they found Surapin and team. "The foreign divers came here as volunteers. They are confident in their abilities." said Surapin, who noted the amount of specialized equipment they carried. "You have to understand that these foreigners have a bit of crazy in them. They like to do crazy things. But they are very good at diving." Surapin and his group were part of an early group of helpers who rushed in before the rescue effort was properly organized. The others working inside the cave were apparently not as tired, however. "When I woke up I thought to myself 'Why is the cave half-flooded?' So I ran out to look toward the entrance," Surapin said. "I looked back and ran to the high mound where we were sleeping. It turned out everyone had left and it was only the four of us left. I told my guys 'wake up, wake up.'" Surapin said the group was not immediately worried if the waters did not rise further, because they had enough food and supplies to last a month. Still, there were announcements to evacuate the cave and its surroundings because water levels began to rise again. "I was telling my guys, if it can rise it can decrease. It will probably decrease in the morning," Surapin said. "But no, the amount of water kept increasing." 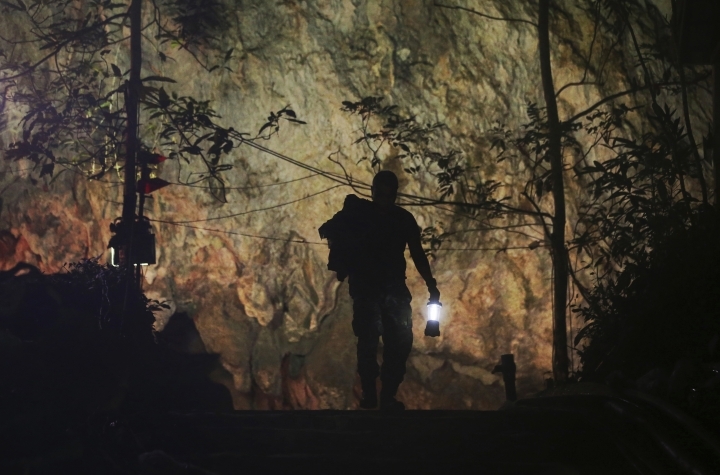 At one point, Surapin said, he began to hear clanking noises under the water that he later found out was the sound of the British divers and their oxygen tanks knocking against the cave's walls. "The sound was coming from the cave's entrance and it was getting louder and louder," he recalled. So he began throwing rocks into the water. "The first rock I threw in didn't get a reaction. The sound of clanking tanks was still soft," he said. "So I threw another one. This time, the clanking noises got really loud and we heard clanking non-stop. After that I saw a flashlight begin to surface and told the guys 'hey, there really is someone here.'" He said when the divers found his group, "They thought they found 13 people. I told them 'no, it's four.' They said 'OK, oh my God.'" Surapin said his three employees now say they will never go near a cave again. "If you want me to go up a tree, I'll go up a tree," vowed one. "But no caves anymore, they're scary."